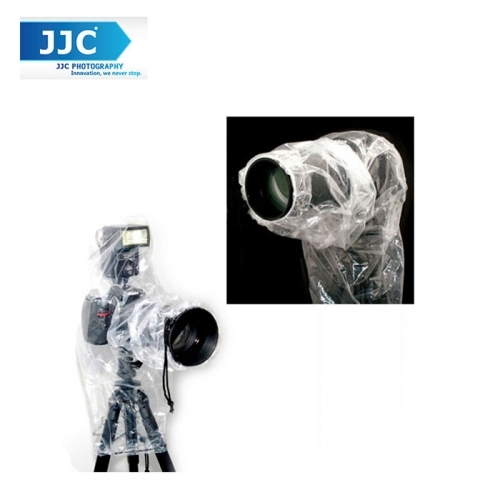 JJC RI-4C Camera Rain Cover is designed to protect your camera from rain, dust and mud effectively when you shoot in rainy days. The package includes two pieces of rain covers, both for use with DSLR with Lens up to 18". One allows you to attach a shoe-mounted flash, while the other one is used without flash. JJC RI-4C is made of PE material and is totally see-through, which gives you complete access to your DSLR's controls and viewfinder. What’s more, the rain cover mounts on a camera easily. Just pull the lens sleeve drawstring properly, and it will fit your lens closely. It also allows you to attach your camera on a tripod. With the cover on, you can still use a lens hood. Besides, the cover is lightweight and easy to carry. With JJC RI-4C camera rain cover, you will feel relaxed when shooting in rainy days. The RI-4C rain cover protector combo package includes two quality rain cover protectors. One is for SLR camera with flash, and the other one is for camera without flash. This rain cover is designed to protect a camera, lens and shoe-mounted flash from any unexpected weather condition. There is an eyepiece opening that fits most camera viewfinders and allows composing shots through the lens, not through the plastic. The camera and lens controls are easily visible and operable through the rain sleeve with an extra area to protect the flash unit. A drawstring lens opening provides easy access and a snug fit for the sleeve. It fits an SLR and DSLR camera and lens up to 13.5" with a 6.5" lens diameter. For DSLR with Lens up to 18"
JJC RI-4C Rain Cover will accommodate a DSLR with a lens up to 18" (45cm) long and 7" (17cm) wide. The following has listed part of compatible lenses.